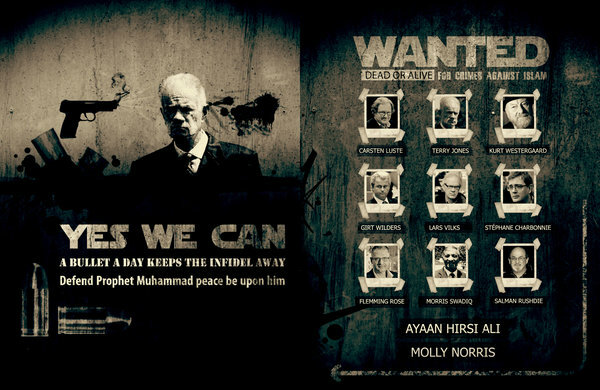 A recent issue of “Inspire” – the propaganda magazine published by Al Qaeda in the Arabian Peninsula – named Stéphane Charbonnier, the Charlie Hebdo editor, on its suggested hit list of Westerners who have insulted the Muslim religion. This, according to a NYT’s article suggesting that the Charlie Hebdo attack was the work of Al Qaeda or ISIS because the attackers were so casual, calm and well trained for the task. So much so that one of them stopped to pick up a sneaker they had dropped during the melee. Well, then that settles it. Why shouldn’t we believe a murderous criminal in the middle of his bloody rampage? Surely, he is the most trustworthy to take for his word at a time like this. But not everyone thinks so. But why let a little thing like the truth stand in the way of beating the drums of war against Islam? Another tell tale sign that this whole sordid affair was more likely cooked up by some friendly neighborhood zionists, bent on fanning the flames of endless world war against Islam is the TImes’ reliance on “SITE intelligence,” a zionist agency from which the western world has gotten all of its anti-Islamic propaganda since on or before 9/11. Apparently, SITE has an exclusive contract with the world’s islamic terrorists, because no one ever cites anyone but SITE. Finally, the video included in the NYT’s article, showing one of the gunman allegedly executing a downed french officer by shooting him in the head is oddly, blacked out, precisely at the moment where it is obvious that the bullet missed the officer and hit the sidewalk just behind him instead. Thankfully, diligent bloggers had noticed this anomaly immediately after the shooting and downloaded the original footage for future naysayers to peruse. From the original, it becomes obvious that the NYT had no legitimate reason to black out the footage where it did, because no blood is evident, since indeed the shooter clearly missed the officer’s head. This alone should be proof positive, for anyone with a head, that Charlie Hebdo was a setup and the mainstream media is in on it. Next Move over ISIS, KKK is Back! “Cui bono, then, with killing Charlie? Only those whose agenda is to demonize Islam. Not even a bunch of brainwashed fanatics would pull off the Charlie carnage to show people who accuse them of being barbarians that they are, in fact, barbarians. French intel at least has concluded that this is no underwear bomber stunt. This is a pro job. That happens to take place just a few days after France recognizes Palestinian statehood. And just a few days after General Hollande demanded the lifting of sanctions against the Russian “threat”. The Masters of the Universe who pull the real levers of the Empire of Chaos are freaking out with the systemic chaos in the racket they so far had the illusion of controlling. Make no mistake; the Empire of Chaos will do what it can to exploit the post-Charlie environment – be it blowback or false flag. The Obama administration is already mobilizing the UN Security Council. The FBI is “helping” with the French investigation. The Obama administration is already mobilized to offer “protection” – Mob-style – to a Western Europe that is just, only just, starting to be diffident of the pre-fabricated Russian “threat”. And just as it happens, when the Empire of Chaos mostly needs it, evil “terra” once again rears its ugly head. Well said, Pepe. Well said.